Complexity theory including the concepts of chaos and emergence has been considered one of the most revolutionary products of the 20th century having influence on science, technology and economics among others. Any complex systems, such as organisms, societies, stock market or the Internet, have emergent properties that cannot be reduced to the mere properties of their parts. The theory has been used in organizational studies and strategic management where it offers an alternative way to look at organizations. The theory rejects the idea of organizations seen as machines and a planned approach to organizational change. Instead, the theory underlines understanding on how organizations adapt to their environments. Complexity theory suggests that organizations tend to self-organize themselves to a state where they regulate themselves. Complexity theory would advocate for approaches that focus on flatter, more flexible organizations. It shifts focus from management control to self-organization and individual interrelations between different people. The aim of Navigating through Changing Times:Knowledge Work in Complex Environment is to give insights on how complexity has changed the environment of many business organizations. The book aims at identifying and discussing special features of business organizations performing knowledge work in a knowledge-oriented economy. 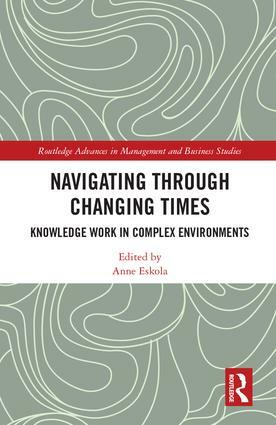 Navigating through Changing Times:Knowledge Work in Complex Environment will be vital reading for those scholar and researchers in the fields of knowledge and wisdom management as well as organizational behavior and communication, HRM, strategy, culture, change and development and other related disciplines. 15. Navigating in Turbulent Environments: How to Keep Staying in the Game? Dr Anne Eskola is a Principal Lecturer at the School of Business, JAMK University of Applied Sciences, Finland.